The story: Pippi is a little girl who lives all alone in a big house - well, not alone: she has no mother and her father is the king of a far-away cannibal tribe but she does have a beloved horse and monkey. When two neighboring children meet her, shenanigans ensue as Pippi tries out school for the first time, dodges some policemen, and celebrates her birthday. Mama opines: Well, this is a first for us. We got this book from the library and read the first few chapters. That night, David asked to take it up to bed with him and I said yes. The next day, I asked if he wanted to read a few chapters. He told me no - he finished it the night before! I'm still getting used to having a reader...I was a bit sad he finished it without me because I've forgotten how the book ends! This book is a lot of fun. Pippi and her friend get into a lot of trouble, but there is a serious lack of respect for rule and authority. You have to gauge if your child is the type to retort that they don't have to follow the rules because Pippi doesn't and that they are going to go live without a mommy or daddy too....If that's the case, you might want to skip this one. 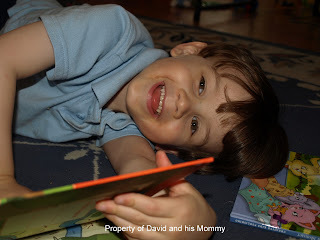 Thoughts from David: I like it because Pippi Longstockings lives without any daddy or mommy and she tricks two policemen! Then she climbs a tree to trick the policemen again. Favorite part: When Pippi climbs the tree. It's Monday and we are done being sick! It's Monday and another week is on its way! It's Monday - Goodbye January!